When it comes to cities in the United States offering free things to do, the city of St. Louis may be the best places for the budget-minded traveler. With major attractions like the St. Louis Zoo, the Science Center, and the St. Louis Art Museum all offering free admission, you can have a chance to see some of the best the city has to offer on your vacation to the Gateway to the West. When planning the budget for your trip, consider that while many of these attractions may be free, there may be additional charges to access special exhibits and amenities. Visit the attraction's website or call ahead before you go to check pricing details and hours of operation. The St. Louis zoo is ranked as one of the best in the entire country, and in September 2016, the St. Louis Zoo was chosen as the number one free attraction in the United States by USA Today’s 10 Best Readers’ Choice Awards. The zoo is home to more than 5,000 animals from all seven continents, offering a new and unique experience every time you visit. Whether you’re there to see animals at Penguin & Puffin Coast, or to welcome baby elephants in the River’s Edge, it’s hard to beat a day at the zoo. Although admission to the zoo is free, some attractions like the Children's Zoo and Zooline Railroad do have a small admission fee. The St. Louis Zoo is located in Forest Park and is open daily from 9 a.m. to 5 p.m., with extended hours in the summer. The St. Louis Science Center is truly a hands-on experience for the whole family. You can test your knowledge of fossils and dinosaurs, clock the speed of cars on Highway 40 with a radar gun, or experience what it’s like to travel to outer space in the planetarium. The Science Center is open Monday through Saturday from 9:30 a.m. to 4:30 p.m., and Sunday from 11 a.m. to 4:30 p.m. Admission to the Science Center is free, but you will need to buy tickets to special exhibits and the OMNIMAX Theater. The St. Louis Art Museum has more than 30,000 paintings, drawings, and sculptures and also boasts one of the world’s top collections of 20th-century German paintings. There are free kid-friendly tours and activities on Sundays, and special free lectures and live music on some Friday nights. The St. Louis Art Museum is open 10 a.m. to 5 p.m., Tuesday through Sunday. On Fridays, the museum is open until 9 p.m. The St. Louis Art Museum sits atop Art Hill in Forest Park. Whether it’s the 1904 World’s Fair, the expeditions of Lewis and Clark, or Charles Lindbergh’s flight across the Atlantic, the Missouri History Museum has it covered. The museum provides a look back at key events that shaped St. Louis through the centuries, with plenty of artifacts, exhibits, and other stuff to capture your imagination. General admission is free, though there is a fee for special exhibits. The museum is open daily from 10 a.m. to 5 p.m., with extended hours on Tuesday until 8 p.m. The Missouri History Museum is located in Forest Park. You can see how Budweiser and other Anheuser-Busch beers are made during a free tour of the Anheuser-Busch Brewery in Soulard. You'll also learn about the history of beer-making in St. Louis and see the technology used to brew today's beers. At the end of the tour, there are free samples for those 21 and older. Tours are available Monday through Saturday from 10 a.m. to 4 p.m., and Sunday from 11:30 a.m. to 4 p.m., with extended hours during the summer. The Anheuser-Busch Brewery is located just south of downtown St. Louis. Citygarden is a great urban park in the heart of downtown St. Louis. It's filled with fountains, wading pools, sculpture, and activities year-round. It's a great place to do a little people-watching, take a walk or let the kids play on a warm day. Citygarden also hosts free concerts and other events in the summer and an annual Christmas light display each winter. Citygarden is located along Market Street between 8th and 10th Streets in downtown St. Louis. It is open daily from sunrise to 10 p.m., as are most public parks in the city. Special events, especially around Christmas time and in the summer, may keep the park open even later. The Municipal Opera in Forest Park is the nation's largest and oldest outdoor theater. Live performances at the Muny have been a summer tradition in Forest Park for nearly a century. Each year, the Muny stages seven musicals starting in mid-June and ending the first part of August. For every performance, there are nearly 1,500 free seats available at the back of the theater. They are available on a first come, first served basis. The free seat gates open at 7 p.m., and the shows start at 8:15 p.m.
Grant's Farm is another great place to see animals from around the world. The 281-acre farm in South St. Louis County is home to hundreds of animals, including the famous Budweiser Clydesdales. A tram ride takes you to the middle of the park. From there, it's easy to explore. Admission to Grant's Farm is free for everyone, but parking is $12 per car. Grant's Farm is open on weekends in the spring and fall, and every day (except Monday) in the summer. The park is located in South St. Louis County. A visit to the World Bird Sanctuary is your chance to get an up-close look at bald eagles, owls, falcons, vultures and more avians species. The Sanctuary is also the place to learn more about the world's threatened bird species through a variety of seasonal shows, educational programs, and special presentations. Admission and parking to the WBS are free. The World Bird Sanctuary is open daily from 8 a.m. to 5 p.m. (except for Thanksgiving and Christmas). For a look at ancient history in the St. Louis area, there is no place like Cahokia Mounds. This archeological site was once home to the most advanced civilization north of Mexico. The U.N. has named Cahokia Mounds a World Heritage Site because of its role in early Native American history. Visitors can climb to the top of the mounds, take a guided tour, or check out the exhibits in the Interpretive Center. Cahokia Mounds also hosts special events like Kids' Day, Native American Market Days, and art shows. Admission is free, but there is a suggested donation of $7 for adults and $2 for children. Cahokia Mounds is open Wednesday through Sunday from 9 a.m. to 5 p.m. The grounds are open daily until dusk. The Cathedral Basilica in the Central West End is more than just a church; it is the spiritual center of the St. Louis Archdiocese. It is also the home of one of the largest collection of mosaics in the world. It took nearly 80 years to install the more than 40 million mosaic glass pieces that adorn the inside of the church. Guided tours are offered Monday through Friday (by appointment) or on Sundays after the noon mass. Laumeier Sculpture Park is an outdoor art museum in South St. Louis County. Visitors will find dozens of pieces of art spread out among the park's 105 acres. There are also indoor galleries, special exhibits, and family events. Every year on Mother's Day weekend, Laumeier hosts a popular art fair. Laumeier Sculpture Park is open daily from 8 a.m. to sunset (except Christmas and the day before the art fair). Free guided tours are offered the first and third Sundays of each month from May to October. The one-hour tours depart from the museum shop at 2 p.m. The Mississippi River has played a key role in the history of the St. Louis area. Visitors can learn all about the Mighty Mississippi and other rivers through the educational and interactive exhibits at the National Great Rivers Museum. You can also take a free tour of the largest locks and dam on the Mississippi River. The museum is located next to the Melvin Price Locks and Dam in Alton, Illinois. It's open daily from 9 a.m. to 5 p.m. The museum is closed on Thanksgiving, Christmas Eve, Christmas Day, New Year's Eve and New Year's Day. The Pulitzer Foundation is a place that celebrates art through exhibits, gallery talks, tours, concerts, and other collaborative programs. The museum is located in Grand Center and is free and open to the public on Wednesday from 10 a.m. to 5 p.m., Thursday, and Friday from 10 a.m. to 8 p.m., and Saturday from 10 a.m. to 5 p.m. While it does cost money to ride to the top of the Gateway Arch, the Museum of Westward Expansion located under the Arch is free. It features exhibits on Lewis & Clark and 19th-century pioneers who moved America’s borders westward. 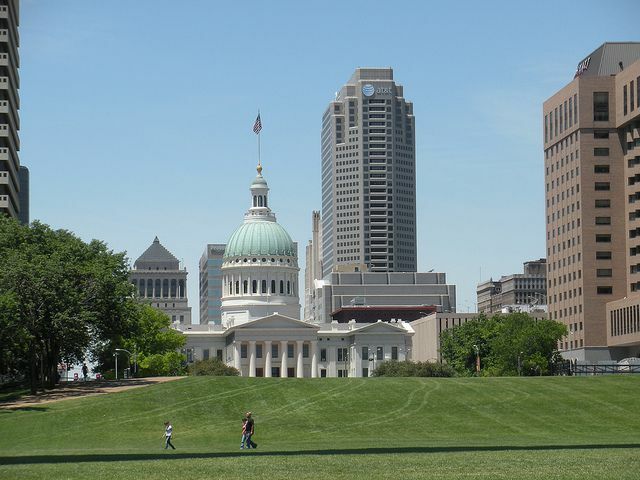 Just across the street from the Arch is another free attraction, the Old Courthouse. This historic building was the site of the famous Dred Scott slavery trial. Today, you can tour restored courtrooms and galleries. The Museum of Westward Expansion is located under the Gateway Arch. It is open from 9 a.m. to 6 p.m. daily, with expanded summer hours from 8 a.m. to 10 p.m. The Old Courthouse is open daily from 8 a.m. to 4:30 p.m., except Thanksgiving, Christmas and New Year’s Day.